November 17, 2011 By This post may contain affiliate links. 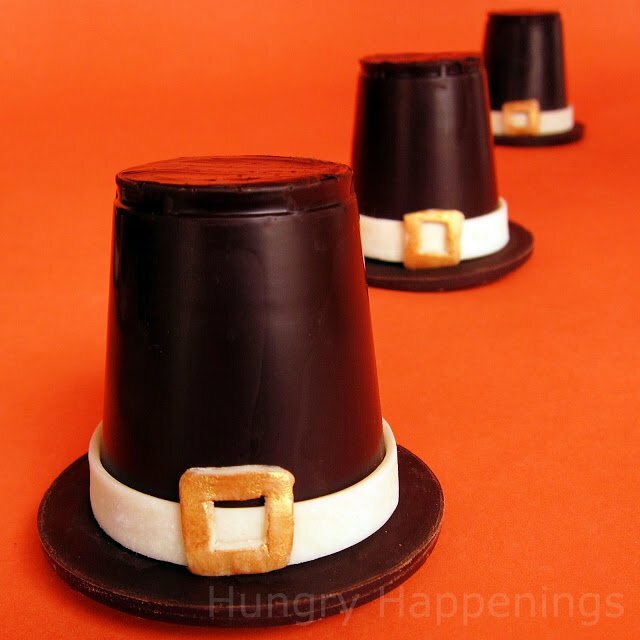 Add a sweet ending to Thanksgiving dinner with these Chocolate Pilgrim Hats! This chocolatey treat is so simple to make and even more enjoyable to dig into. Thanksgiving has never been on the top of my favorite holiday list, but I married a man who considers it the number one holiday. He has the day off of work, gets to relax in front of the television, and loves to eat turkey, mashed potatoes, green beans and pumpkin pie (his favorite meal.) What’s not to love? Even as a kid, although there are other much more exciting holidays, in my opinion, he loved Thanksgiving. When I was younger, I never got excited about eating the actual Thanksgiving dinner and ate very little, as a matter of fact, but I couldn’t wait for dessert. I wanted to jump headfirst into the pile of pies, gobble up lots of cookies, and leave no chocolates behind. I would sit at the table listening to all the moaning as everyone else was too full to indulge any further. Then I’d have to wait patiently through what felt like endless hours of football on the television for dessert to be served. It was torture for me. As an adult, although I have come to enjoy the actual turkey dinner, the desserts are still the highlight of the meal. We have been invited to a friend’s house this year for Thanksgiving, as everyone in our family will be out of town. My friend’s aunt, who is a wiz in the kitchen, will be making homemade pies, which I can’t wait to try. I have been asked to bring chocolate, as well as, a few other things. I decided to make some molded chocolate turkeys and leaves, as well as, some chocolate pilgrim hats. 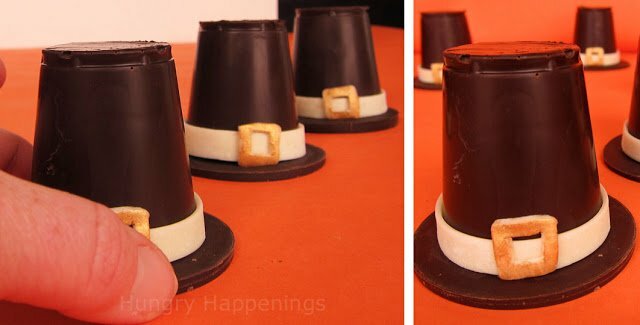 I’ve seen so many cute and clever ways of creating a pilgrim hat out of chocolate candies and decided to try my hand at making a little more elegant version of it. After playing around with a few techniques I settled on making a hollow chocolate pilgrim hat which I will fill with chocolate mousse. 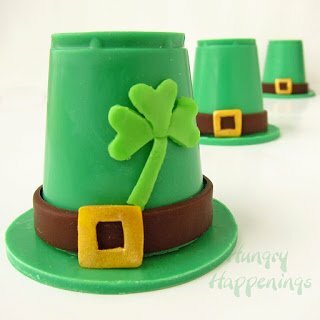 I created my hats by filling a small plastic cup with chocolate, then pouring out the excess to create a shell. When it was chilled and un-molded and set on a round of chocolate it made a perfectly shaped hat. Each hat is decorated with a band and buckle made of homemade white modeling chocolate. I used gold luster dust to make my buckles shimmer, but you can, if you prefer, just color some modeling chocolate yellow. Before you begin, if you aren’t experienced with making chocolate, read my tutorial regarding types of chocolate, how to melt chocolate, and troubleshooting any problems you may encounter. 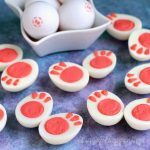 The recipe for the modeling chocolate is also included in the tutorial, but if you prefer, you can simply use store bought fondant. Completely fill a cup with melted and tempered semi-sweet chocolate or melted confectionery coating/candy melts. Turn cup upside down over your bowl of chocolate and allow all of the excess to drip out. My tempered chocolate is fairly thick, so I tap on the bottom of the cup with the end of my spatula to help move the excess chocolate out. If your chocolate is thin, just allow it to drip out. Use a metal spatula to scrape off any chocolate that is dribbling from the cup. Use your finger to wipe away any excess chocolate along the opening of the cup. Set the cup upside down on a parchment paper lined baking sheet. Repeat to create 12 chocolate cups. Chill in the refrigerator if using pure semi-sweet chocolate for 10-15 minutes and in the freeze if using confectionery coating/candy melts for 8-10 minutes until the chocolate sets. While the cups are chilling, you can prepare the chocolate rounds which will become the hat brims. Reserve about a tablespoon of chocolate for a later use, pour the remaining chocolate out onto a parchment paper lined baking sheet. Use an offset spatula to spread it into a thin layer, trying to get it as even as possible. I find it helpful to grab hold of the parchment paper on either side of the chocolate and shake the paper until the chocolate smooths out. Let the chocolate sit at room temperature until it just sets – it won’t look shiny any more and will be easy to cut. If it gets too hard it will crack when you try to cut it, so keep an eye on it. Use a 2 3/4″ round cookie cutter to cut out 12 rounds from the chocolate. If the chocolate is too wet and the rounds don’t come out nicely, allow the chocolate to set a bit longer. I like to flip the chocolate rounds upside down on the parchment paper lined baking sheet before putting them in the refrigerator or freezer to allow them to set completely. This keeps them from warping. You can nibble on the excess chocolate as long as you don’t need to re-melt it to make any more rounds. Once your chocolate cups have set, pull them out of the plastic cups. If they wont budge, take a thin knife and run it around the edge of the cup removing any chocolate that may be stuck around the rim. Then you should be able to easily remove the chocolate from the cups. 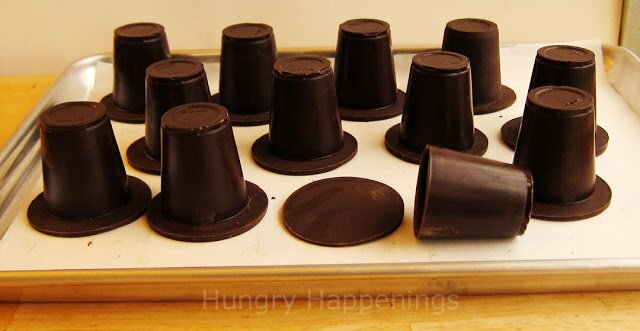 Remove the chocolate rounds from the refrigerator and set the chocolate cups on top. If your chocolate cups have words imprinted on them (the bottoms of my cups had “Solo” imprinted on them) you can, if you choose, cover it with some chocolate. I smeared a very small amount of chocolate over the words and scraped it flat with a metal spatula. Lightly dust a cutting board with powdered sugar. 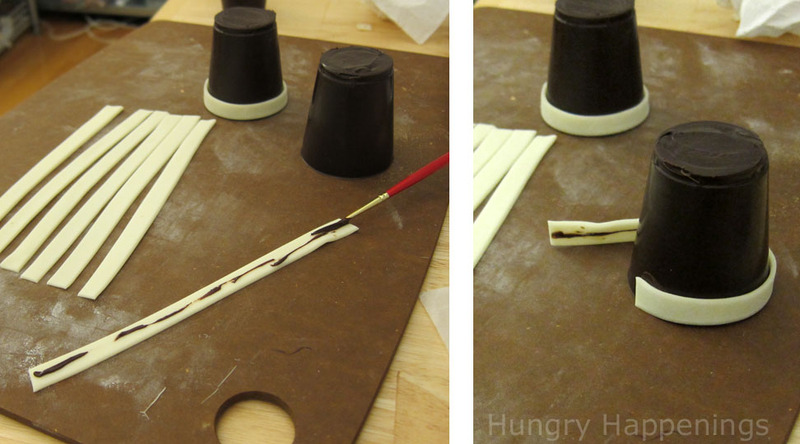 Use a rolling pin to roll out your modeling chocolate to 1/16th inch thickness. Cut 12 long strips. Each should be about 1/4″ wide by about 6″ long, You’ll need a strip long enough to wrap completely around each chocolate cup, so measure one of your chocolate cups before you cut your strips. Use a knife to cut out squares that are just a bit over 1/4″. Cut out a smaller square in the middle of each to create your buckles. You can dry brush gold luster dust over each of the modeling chocolate buckles, but I chose to dip my brush in some vodka (which will evaporate) and then into the luster dust and paint it on my buckles then allowed it to dry. It gives the buckle a vibrant gold luster. You could, if you prefer, just color some of your white modeling chocolate yellow for your buckles. You will need to carefully re-melt the small amount of reserved chocolate (if using pure chocolate, there is no need to temper it for this purpose.) Use a fine tip paint brush to brush chocolate down the middle of a modeling chocolate strip. Wrap the strip around the large end of the chocolate cup (close to the opening.) Press the seam together. Paint a small amount of chocolate onto the back of a buckle and attach it to each hat. Your hats are now ready to fill with whatever you choose. You can attach the two hat pieces together with a bit of chocolate after filling them. I will make and fill my hats with chocolate mousse on Thanksgiving day. 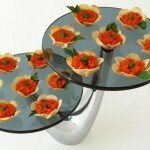 I will set a hat on a dessert plate, pipe or spoon in the mousse, and put the two hat pieces back together. The mousse will act as glue to keep the two pieces together. I want it easy for everyone to pick up the top of the hat, turn it over, and use a spoon to eat the mousse so I wont glue them together with melted chocolate. If you plan to add candy or nuts, it will be a good idea to glue the two hat pieces together. Here are a few more projects using this similar idea. 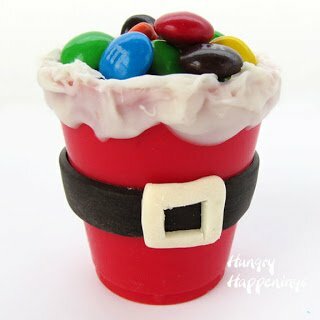 Very Cute- I've been thinking of making hats with candy but I LOVE your idea to use the cups. 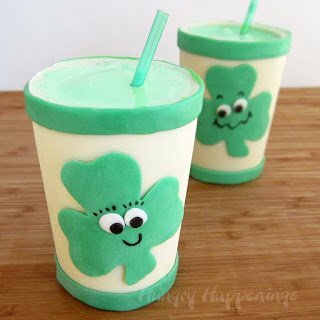 Then you can fill them with something yummy! Thanks for sharing. Thanks Mal and Meg. I am excited to bring these to Thanksgiving dinner. Hi JDaniel4's Mom, I added my recipe to your Thanksgiving traditions link up. Thanks! What an incredibly cute idea! I always have a little trouble with chocolate; might need to read your tutorial first, lol! Love this! 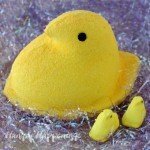 OneMommy – I do highly recommend reading the chocolate tips tutorial. There is a lot of good information. I've been working with chocolate a long time and I've experienced just about every problem you can encounter and found a way to make things work. Good luck. Wow…you have a lot of patience 🙂 Those are adorable. Siobhan, thanks for adding the link. I guess I missed that box this morning when I posted. I just found your tumblr site and love it. Thanks for the link Meaghan:) I'm glad you like them. Beth, you never cease to amaze me. Your writing style and content, your clear and clever instructions, your photographs, and of course, the "mmmmmm factor" make your blog an enjoyable learning experience. Your passion is evident in all of your posts. Your entire blog is a blast! 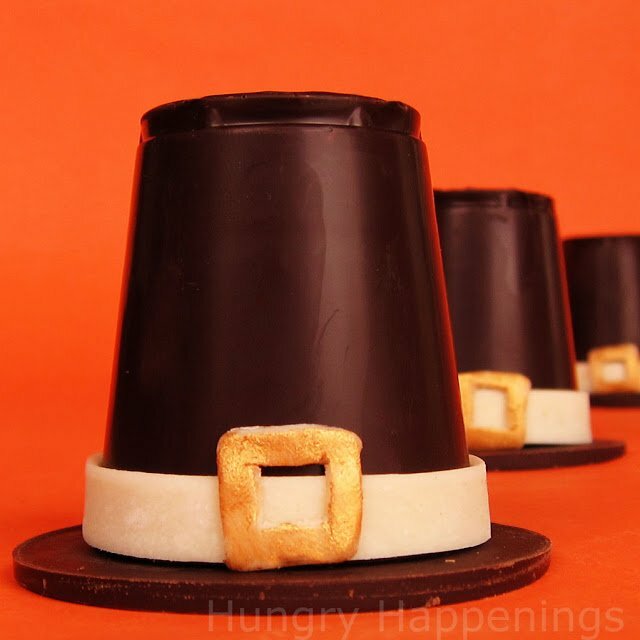 These chocolate pilgrim hats are the perfect cap to a Thanksgiving meal. Hi Pete, wow, thank you so much. It is so nice to hear such a wonderful compliment. Hi Jo, I just posted the picture of this recipe on foodepix and will post more later. Thanks. 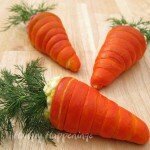 I'm thinking of making these for Thanksgiving this year, but I don't have much chocolate experience. 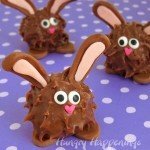 I read the tutorial, and I was wondering about using the chocolate mousse as a filling. In the Valentine's Day cake it was baked. How do you use it to fill the hats? There are raw egg yolks in it. 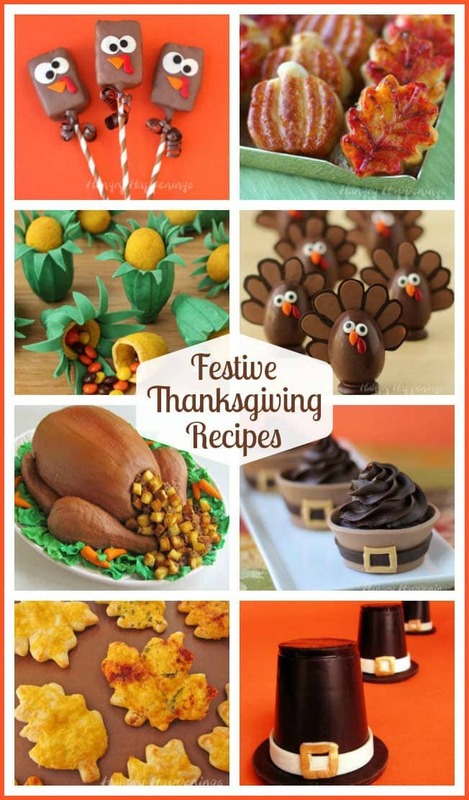 Hi, these are so cute, and I'm thinking of making them this Thanksgiving. I don't have much chocolate experience, so I read the tutorial section which was wonderful. My question is how do you use the chocolate mousse as a filling? In your Valentine's cake recipe it is baked, but it can't be baked for this, and there are raw egg yolks in it. I did actually use the dark chocolate mousse from my Triple layer mousse cake recipe from the Valentine's Day post. 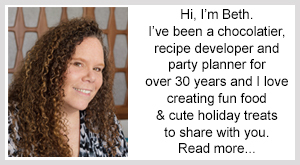 It is my favorite chocolate mousse recipe. The dark chocolate mousse layer is not baked; only the cake layer is baked. The egg yolks do actually get heated up enough to be safe to eat in the recipe as you will pour boiling hot sugar syrup over the egg yolks. You can check to make sure the temperature is 160 degrees just to be safe before proceeding with the recipe. Whenever I have checked the temperature, it has always gotten above 160 degrees, so I feel confident in the recipe. I've made it dozens of times and served it to many people. It's delicious. 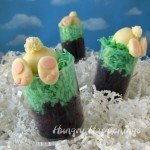 After you make the mousse, just fill your chocolate cups with the mousse then set the filled mousse cup on top of the chocolate round to create the hat. Decorate them and they are ready to serve.